Submitted by MichaelMerino on Wed, 04/20/2011 - 11:54. 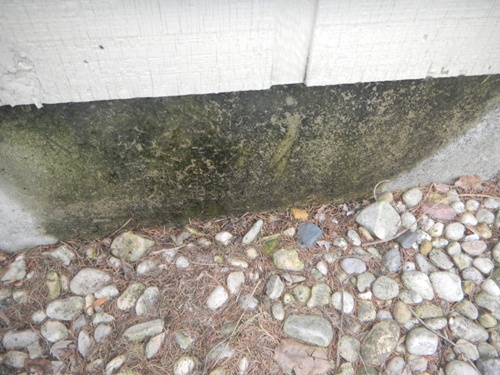 I was performing a home inspection in Plainfield Illinois and noticed this wet area on the foundation. At first glance it appears this may be from rain and absorption of water from the ground, but I ran my hand along the underside of the wall covering and the covering and foam insulation behind the wall covering was also wet. As you can see by the picture that took at the home inspection, the area has a green color to it, which indicates to this Plainfield home inspector that this is a chronic problem. The question is where is the water coming from? There is a gutter above, which could be leaking and spilling water behind the wall covering; the laundry room is on the other side of the wall which could have a plumbing leak, but there is also a water heater in that same area. As a Plainfield home inspector you have to be part detective and investigate the options. I ruled out the gutter because they were unobstructed and the exterior wall covering had no signs of water leaking or damage. As the home inspection progressed to the interior I was inspecting the laundry area and did notice that there were wall repairs at the drain system for the washer. During all home inspections in Plainfield I will run the washer and dryer, and at this time the drain was not leaking, but the supplies did have a small slow leak, so now I had a possible reason for the wet area on the foundation. I told my client that this could possibly be the reason and he should have the plumbing fixed and it may have been an issue in the past due to the wall repairs at that area. I turned my attention to the water heater, as this is part of the home inspection process as well. Plainfield home inspectors should inspect the water heater and report on its condition and this is a perfect example as to why they should. 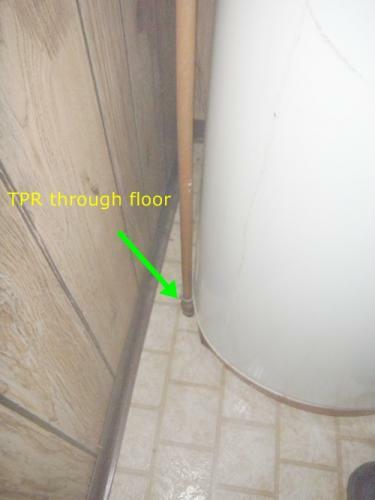 I noticed that the TPR (Temperature Pressure Relief Valve) discharge pipe terminated below the floor into the crawl space, instead of terminating about 6 inches above the floor. The TPR discharge pipe should terminate at that point so that when the pressure or the temperature gets too high, the valve will open and allow the water to discharge and relieve the pressure. You will see the discharge and know there is a problem; as opposed to not being able to see it if it is discharging into the crawlspace. My job as a Plainfield home inspector is to educate my clients, so I explained this to my client on site as well as reporting it in the home inspection report for the client’s future reference. A Plainfield home inspection will include an inspection of the basement and/or crawl space. Your Plainfield home inspector put on his protective equipment and climbed into the crawl space to finish the home inspection. The first thing I saw was this wet area at the adjacent area to the exterior water stain. As I got closer I could see the end of the TPR discharge pipe and it was dripping water all over the sill plate and the foundation. This was the source of the water staining on the exterior. The water was running under the sill plate, which had no sill gasket but should have one, and emptying to the outside foundation wall. This is exactly why the TPR discharge pipe should terminate 6 inches above the floor, so you can see the problem. 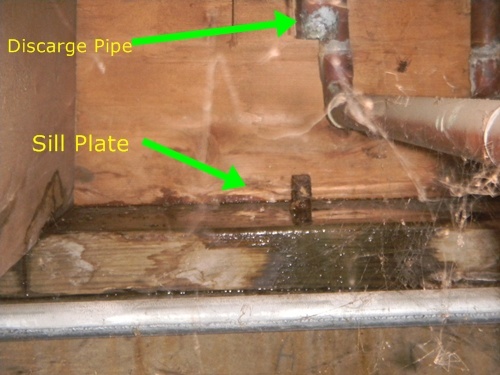 The valve is leaking and needs to be replaced and the discharge pipe should be cut back to above the floor. Most people will not go into the crawl space unless they have to, except for home inspectors; we are in them all the time. The best news is that this is an easy repair and won't cost the client a bunch of money. This is a great example why you should have a home inspection performed by a qualified home inspector.